Bangladeshi and Bangladeshi British Columbians are people identifying or identified as Bangladeshi. Bangladesh is located between India and Myanmar by the Bay of Bengal. The Bangladeshi – British Columbia population data represent DNA samples from 50 Bangladeshi-Canadian (Bangladeshi Canadian) individuals in the western province of British Columbia. Samples were commercially obtained from Helix Biotech, based in Richmond, British Columbia. Bangladeshi represents 156 unrelated Bangladeshis who were sampled in 2004 by the Dubai Police, US FBI, and Strathclyde University in the UK. 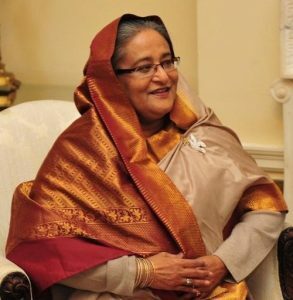 Photo: Sheikh Hasina, Prime Minister of Bangladesh. Photo by Prime Minister’s office, Wikimedia Commons. Source publication: Bangladeshi – British Columbia (population 81): Allele Frequencies for Nine STR Loci in African-Americans, Chinese, Vietnamese, and Bangladesh Populations, JFS, 1999, p1316-1318. Bangladeshi (population 250): STR population diversity in nine ethnic populations living in Dubai, FSI 152 (2005) 267-279.